The best document management software is a really essential asset for business. If you are really serious and would like to increase business efficiency, this is the best software for you. Document management software is also called as a document management system in the industry where you can digitally upload documents and files to the software and easily edit them and track records as well. You can smoothly manage the all crucial business docs and easily get the required documents through the search feature. It’s a centralized place where you can manage documents and share with other users. You can also track other user activities through this software. Here you can control all the documents and files which one is essential for business, so it’s also known as document control software in the tech world. It’s a quite helpful feature for the business where you don’t need to bother about document security. You never misplace your business documents through the best document management software. 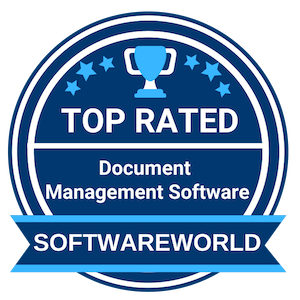 SoftwareWorld provides the unique collection of top rated document management software. Let’s take a look. What are the Best Document Management Software in 2019? About Samepage : Samepage is leading collaboration software in the industry. It’s an award-winning document management software where you can easily share the required documents with your team in real time from any devices. You can not only share but also track text, files, videos, images, tasks, diagrams and much more through Samepage. It’s a best document collaboration tool where you can easily archive the document and also get file recovery option. About ShareFile : ShareFile is the Citrix document management software for small and medium organizations. You can easily increase your business productivity level through ShareFile. You can able to share any size files or documents through this software and bank-level encryption protects your documents, files, email, and attachments. You can send, share and get feedback approvals through this software and you can also find e-signature option over there. “I have a professional business and so I like the clean, professional look of this service. It reflects well on my practice and appears more legitimate than something like Google Drive.” – Mark D.
About eFileCabinet : eFileCabinet is the renowned document management software for Accounting, HR, Insurance and Legal Firms. You can comfortably organize, capture, digitalize and approve your business document through this software. It’s the best software who handles the business processes for you. You can archive and index document through this software; it also offers an electronic signature feature to your files and documents. It’s also suitable to integrate with third-party software. About Process Street : Process Street is a checklist, Workflow and SOP software where you can easily manage your team’s recurring checklist and associated procedures. You can create structured documents within seconds by using its simple interface. This software provides the best option for the collaborative workflow where you can create and assign the checklist to your team and track their activities through the dashboard. This document management software offers offline access as well. About CapLinked : CapLinked is a celebrated Virtual Data Room Solution provider in the industry offers secure document sharing feature to the businesses. You can develop business workflow and securely share the business files through this software. With the help of this software, you can share sensitive information with in-house and outside collaborators. It’s the document management software where you can edit, share, and collaborate on documents with others. “The ease of use is the one of the reasons why we use CapLinked. We work with a lot of outside consultants and customers that need to access folder and files and not once did anyone struggled to access their data. We tested a few data rooms and CapLinked was by far the best value for money. Super easy to use.” – Elmo L.
About MangoApps : MangoApps is modern workplace software for your employees. It’s an intelligent employee platform where they can easily collaborate with each other. MangoApps document management software offers the ability to the user where they can create office document, edit and share with others. You can also find exclusive features of document management software like compliance tracking, document archiving, document indexing, file recovery and version control through this software. “Easy to setup! User Friendly! Great features! The service we got from the first contact with Mango was really great! The service is fantastic and the features are convenient! Incredible service! Incredible help!” – Julie D.
About LibreOffice : LibreOffice is a document management app offers document management features where the user can create Microsoft word document, excel spreadsheets and Powerpoint file; a user can also edit and view the documents through this software. The software works as a collaboration tool where you can get document assembly, document indexing, and file type conversion features. LibreOffice is an OffiDocs software for emerging businesses. “Great open source software.It is a great software, being open source and runs on every OS, it has great futures letting you manage all the sheets you need. A great choice for day to day use” – Harvey N.
About FileInvite : FileInvite is documented collection software where the user can easily manage client documents and request for files. You can comfortably automate your document collection through this software where you don’t need to chase clients for files. It offers easy to use way where you can request for documents and collect them easily. You can easily increase the follow-up strategy through this software and easily increase the productivity of your business. “I loved the fact that all the documents that I needed from a client were not only sent to the client in one actionable file but also that the clients had a clear visual of what they had and hadn’t sent. The auto follow ups for documents not yet received was also a valuable time saver. Brilliant time saving product” – Renee G.
About Dokmee : Dokmee is an Office Gemini document management software allows users where they can securely manage all the business documents and centralized the location for effective document management. Any sized business can apply this software to their process because of its multiple versions and deployment methods. You can also find cloud storage features for your document management solution and you can easily access from anywhere from any devices. About Qualityze : Qualityze is an Enterprise Quality Management System (EQMS) software offers document management features to the businesses. The user can maintain quality documents like SOPs, quality records, work instructions, change controls and much more through this software. Qualityze is easy to implement DMS software where the user can create, collaborate, review, approve, release and archive business documents. You can also get an electronic signature option through this software. Every day businesses and companies have to share a lot of data and information among each other or in between the organizational employees. This can seem to be a pretty tough task if the documents are recorded and shared using traditional methods which are mostly pen and paper-based. This is because it increases the chances of mistakes while risking the efficient functioning of the firm. To recover from this, various companies have started digitally recording and storing the documents, but that also has a demerit. Many large companies and businesses often have to undergo a lot of turmoil while searching for a previously used report among the heaps of others. This is where document management software can prove to be beneficial. Starting from document creation, tracking, storing, and archiving, the simple yet compelling software can offer numerous benefits for reducing time wastage and thereby increasing productivity. In this guide, we will understand every single aspect of the Document Management System bit by bit. So, let’s start now. » What is Document Management Software? » What are the benefits of Document Management Software? » What are the features of Document Management Software? » How to choose good Document Management Software? » Is it worth investing money in Document Management Software? » How much does Document Management Software cost? » What are the top Document Management Software in 2019? Considered as an innovative solution, the software helps ease the work of organizations and companies by lending a hand for sorting out documents. The Document Management Software is user-friendly and anyone without any prior coding knowledge can easily work on it. Moreover, as the files are centrally stored, this also allows easy retrieval of documents and data from any place and at any time. Thus, using the DMS Software can save time, money and wastage of resources, thereby, increasing your company’s productivity. Now, let’s understand the various benefits the document management system provides and how they are better than the traditional methods of document storing and sharing. As discussed in the starting, document management systems are hardwired to store each document you upload in a single central storage. Whenever a file or document is uploaded, a specific tag and label are added to them which then divert it to a safe and a secure folder for storage. Similarly, when requested, the file can also be easily retracted by using search results or using a filter. The documents stored in DMS Software, are automatically linked with real-time availability, notifying the users when any changes are made. This helps the employees in remaining updated, setting deadlines, getting reminders through pop-up notifications, and more. Moreover, a single document stores multiple versions of the document, eliminating the need for printout every time by automatically storing them. Providing security to the documents and files is the most crucial aspect of a Document Management Software, as any lacuna can jeopardize your company’s working. Hence, various DMS software companies have enabled specific user entry and role-based controls. Through a single DMS software, you can tackle your every documentation requirement. Also, the use of printers, scanners, papers, inks, and other machines are reduced. This not only helps in cutting down the extra cost but also serves as a sustainable alternative against the currently used traditional methods. Every Document Management Solution comes with its own set of features. Getting a brief knowledge of them can help you with further understanding of the revolutionary software. So, without wasting any more time, let’s start with our journey. Apart from creating, editing, storing and sharing, the DMS software can help you arrange your files in a systematic manner. While ensuring centralized storage of every single report, it levels them as per priority. This helps in retrieving the information easily whenever required. Moreover, as discussed previously, the software also saves any changes that are made to the document in a single record only, curbing the need to search through a massive pile of papers. You can choose the number of users those will be having access to DMS software. Keeping a strong tap on the privacy and security of the firm enables users to access the file through a strong channel of system permission. As a security measure, many also provide IP blocking facilities. Furthermore, access controls are also offered to keep a track on the daily activities on the document so as to prevent any potential fraudulent activities. Uploading a large number of documents one by one is not only time consuming but can also be prone to a lot of mistakes. Hence, DMS software comes with bulk uploading feature which can upload a huge set of data at a single time without any human interference. They are also provided with tags and indexes to help in secure storage and retrieval. Uploading PDF files, making corrections and sharing has been made easy with the Document Management Systems. Thus adding texts, textbox, comments, and adding customizations such as data and sidebar is also enabled. One can also use the online spell checkers to verify spellings and any typos. Various DMS software also provides the option for audit trails, which when done shows the complete life cycle of a document or file, such as details on the user, date and time the data was accessed, and more. There are some essential factors which one should always remember before choosing a DMS Software so as to remain on the profitable side. In this list, we have compiled some of the points which can save you from any potential losses. So, let’s check them out. Analyzing the current documentation flaws those need to be addressed should be your first step before going for any Document Management Software. The applications come with a wide range of features some of which you may not require at all. On the other hand, having a list of your priorities will enable you to ask for the right customization. Each software application has been designed to serve small, medium or large businesses and one should always choose the software depending upon their usage. Thus, in case you belong to a small business group, there is absolutely no need to invest in elite subscriptions those cater to big organizations. A vulnerable document sharing software can expose the confidentiality of your business to potential hackers which can result in the jeopardizing of your business. Hence, one should adequately explore every information on the software so as to be on the safe side. One should also properly analyze the total number of users before subscribing the software to avoid any last time confusions. This also aids in deciding the best software as per the operational needs. After all this discussion on the various aspects of the electronic document management system, it may be quite clear as to how one can choose the best document sharing software for their business. Let’s have a brief discussion on the points we earlier discussed. Data comes in different forms, which can be in Excel format, Word, PDF, Powerpoint, and many more. Hence to maintain the efficiency of a business going for a single document controller which supports all file formats is always the best idea to cater to all business needs. What’s better than Document control software which not only helps in the creation and sharing of the files but also lets the approved circle members edit them in case of any desired change. Various software applications allow both editing and adding comments to have a perfect document creation experience. The storage facility where the files are stored is also another important factor while choosing the best DMS software. Businesses need regular interaction with the information and reports, thus, it is better to go for a software application that will give you cloud backup. It will not only ensure about the safe protection of your files but also will eliminate the need for additional servers from your end. Reviews from previous customers who have already used the software can also help in streamlining the confusion related to the services and facilities which are offered by the claiming company. No one will ever want to know after subscribing to a DMS company, that they have been fooled with false claims. Moreover, the right balance of both positive and negative reviews usually shows that the company’s reviews can be trusted. Imagine you are far from your system but still can access and control the documents through your mobile. Wouldn’t that be great? Well, there are many DMS System applications in the market those provide mobile compatibility to their users which helps in accessing and verifying the documents and files from anywhere at any time. When a vendor forces you to choose from a limited number of subscription models then it is better to give it a go. Why pay for features which will be of hardly any use? The point is, you can tailor your own package as many elite level DMS application providers offer that privilege to their customers. Through a pay-as-you-go model, you need to pay for only those features which you require. Many buyers don’t know about such subscription models and jump directly into a decision that leads them to repent till it gets over. Every software application comes with an obvious chance of getting malfunctioned owing to bug attacks. In this regard, it is imperative that the vendor must be able to provide support immediately to avoid compromising the security level of confidential company information. In today’s world, every business and firm are facing cut-throat competition among others to emerge as the leader in their field. Hence, implementing renovating and revolutionary technologies can help in achieving better productivity while reducing wastage of time. Here, document Management tools can provide the best methods of sharing essential documents and information between partners, stakeholders, or employees without any discrepancies. Moreover, in a recent survey, the reports stated that companies and firms having ideal Document Management Solutions witnessed a steep increase in the companies’ operational productivity. Equipped with innovative facilities which help creating, editing, storing, and sharing of information the software has been considered as a must to run a business smoothly stated various experts. But in case if a company wants to hire different individuals for completing the tasks as mentioned above, then there is no doubt that the expenditure will see an increase of about 30-40%. Hence, no doubt investing in DMS Software is the best option for growing one’s business. The pricing plan differs from software to software mostly depending upon the number of users, facilities and tools availed, and the duration. The lowest price for a monthly subscription of the most inferior DMS software can start from $5 and can reach a high of $199 depending upon the features and number of access given. Some software also comes with no charges, but the catch here is that they may not provide premium facilities and tools to their users. However, this is the best method to check for a service’s efficiency in delivering products and at the same time can also be used by beginners’ also. At last, if you are looking for a good Document Sharing Software which can provide a break-through to your company, then you must be pretty careful about it. While investing in a DMS company can be pretty thrilling, any mistake can cost your business to suffer. Hence, preparing a detailed list of the points you want the DMS software to have, including your budget can cut down half of the tedious homework. Similarly, before choosing a particular Document Sharing Software, one should always try out the software initially for free to gain a deeper insight into the claims and the actual result before investing in it. Finding a good document sharing software will not only help you increase operational efficiency, but will also help you to reach the top. » Brand Management Software - If you would like to execute a marketing campaign for your brand, brand management software is the best option for you. You can create new marketing strategies and approve the same campaign through brand management tools. » Business Continuity Software - It has been observed that a Business Continuity Software is gaining a lot of popularity in every nook and corner of this wide globe. This software is an important software suite or a software application, which helps in documenting all the critical information that a business might need in order to continue running despite any adverse situation.